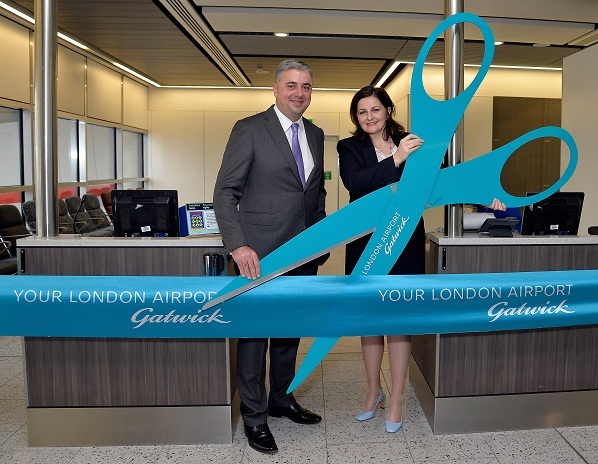 Another milestone in Gatwick’s £2 billion transformation programme was reached today when Gatwick chief executive Stewart Wingate invited Caroline Ansell MP to officially open the airport’s newly-redeveloped Pier 5. The new Pier 5 project is now fully operational and represents a single investment of £80 million forming a key part of the North Terminal transformation plan. The unique design of the pier allowed Gatwick to build a second level and the airport is now able to offer vertically separated arrival and departure routes for passengers. This smooths passenger journeys and creates a more flexible and efficient operation for passengers and airlines. Pier 5 has a new look called ‘London Square’ which draws on Gatwick’s heritage as a major London airport, incorporating London-themed design into all its gate rooms. Wingate said: “Since coming into private ownership six years ago, we have invested more than £1 billion in transforming and growing Gatwick and, to accommodate our growth, we are set to invest another billion. “Total passenger numbers have grown by nine million over this time – today, 40 million people choose Gatwick each year and we have achieved 34 successive months of growth. “To keep pace with this unprecedented growth, we need to be smart about how we work with our existing infrastructure while we wait for a Government decision on airport expansion. One of the key objectives of the build was the redesign and modernisation of the stands, allowing Gatwick the flexibility to handle new and changing types of aircraft. It has the ability to accommodate seven large aircraft and 12 smaller aircraft, or a combination of both. This increased efficiency will continue to support Gatwick Airport’s growth, while helping to improve the performance of our airlines.